Printing Pictures Has Never Been This Easy! Do you have piles of photos just saved onto your cloud that you never get to look at photo? Pictures are more than just images, they are memories. What’s the joy in taking pictures if you never look back at them? Creative Photo Lab brings you an easy solution, with WhatsApp 2 Print. Bring your photos to life with WhatsApp and Creative Photo Lab. Choose to Pick-up or get your pics Delivered. Q : What Are the costs? 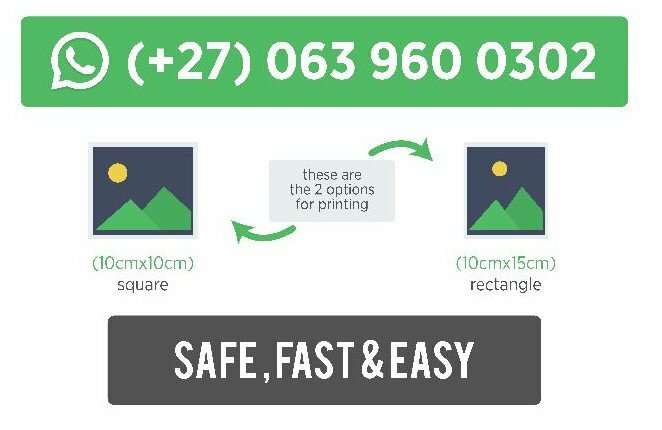 A: 10cmx15cm (that’s standard size) and its 1 to 9 prints for R6.95 per print. 10 plus prints is R4.95 per print. Q : Which sizes do u print? Q : Which substrate do u print on: Gloss or Matt paper? A: This service is on request. Delivery charges will vary dependant on the area. Free Delivery for 100+ prints. Don’t just make memories, start printing them. If you have any questions, feel free to contact us here.